Often you can see wedding cars riding the streets with old cans and a sign “Just married”. That’s a great wedding tradition and usually has a nice design. Alexander recycled that wedding idea into something more practical. One moment you have to stop and get some rest, so you go to sleep. If you are on camping you will probably sleep in a tent. 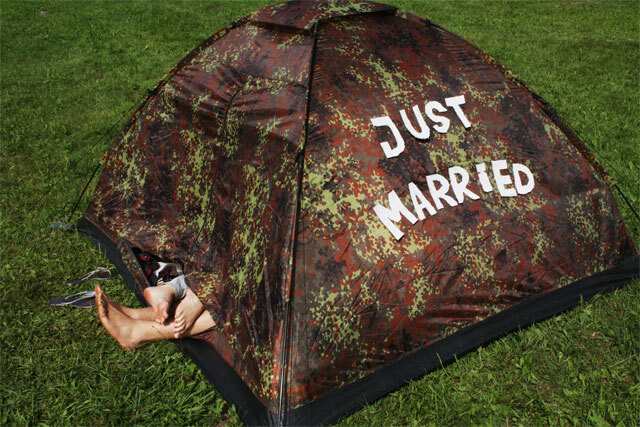 Alexander attached the sign to his tent in his wedding trip. This is the actual photo from his wedding trip. And as you see now everybody knows who lives in that tent (you can hope that nobody will bother you then) – a married couple on a vacation. You can transform it and use “Just married” for absolotely anything – from tents to houses, from cars to bikes etc.